"Maharaja Krishnaraja Wodeyar, Raja of Mysore, bestows the written grant of a freehold on the Minister Purniah. In the days when we, by the Grace and by the aid of our Lord.... .....mounted the throne of the Kingdom of Mysore, confusion and disorganization had, from certain sources, arisen in our dominions.........It became necessary for us to appoint a Minister with plenary powers, to whose integrity and ability the administration of the State ........Since the uprightness, rectitude and honesty of Noble Purniah has been observed, and his ability and sagacity proved and tested,.......And since it is the intention of our Illustrious Mind that the remembrance of the worthy services and befitting actions performed by this Nobleman should not be totally erased and obliterated from the pages of the Record of Time, and moreover that the children of this Nobleman shall dwell in comfortable and easy circumstances, exalted and distinguished for ever and ever; therefore with the advice and approval of the Government of the Honourable English Company, we have conferred the Taluk of Yellandur on the aforesaid Nobleman as an hereditary Freehold (Inam) as long as the Sun and Moon, which are the illumination of the World shall continue. Written in ........agreeing with the twenty-seventh of the month of December, the year one thousand eight hundred and seven of the Christian Era." 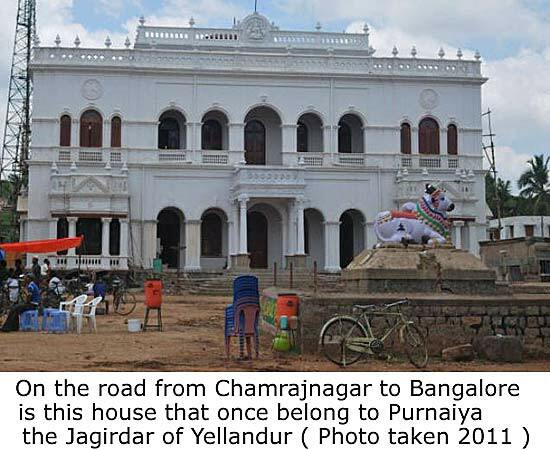 " The Jagir of Yelandur was given by the Raja of Mysore to Purniah, Dewan, at the recommendation of the English Government, and in record of the entire acquiescence and approbation of that State of the reward which has been granted for the faithful and great services of Purniah, I have (as British Resident of the Court of Mysore ) affixed my name and seal to this deed .